The 380580 is a High accuracy, high resolution portable Milliohm Meter (Battery operated) for field use. Four terminal Kelvin measurements. Complete with 8AA batteries, and 2 sets of test leads (4 wire with 4 alligator clips and 4 wire with 2 Kelvin alligator clips). Compact and rugged design featuring a large display. Multiple wide measuring ranges: 20,000Fc in 4 ranges and 20,000Lux in 4. Data hold freezes readings on display. This product also features Min/Max readings, Zero function, Cosine and colour corrected measurements. Auto power off function saves battery life. Meter utilizes precision silicon photo-diode sensor with 3ft coiled cable for easy storage. Complete with built-in stand, remote sensor with protective cover, protective rubber holster and 6 AAA batteries. The 407026 is a Heavy Duty Light Meter with 4 lighting type settings for enhanced accuracy (Tungsten/Daylight, Fluorescent, Sodium, Mercury). Additional features include: Data Hold, Min/Max/Average, Auto power off, and a percent reading of the differential from a reference point. Built-in RS-232 interface with optional Data Acquisition Software and Datalogger. Comes complete with 9-Volt Battery, Remote Light Sensor on a 46 in. cable with protective cover, and a protective holster with stand. 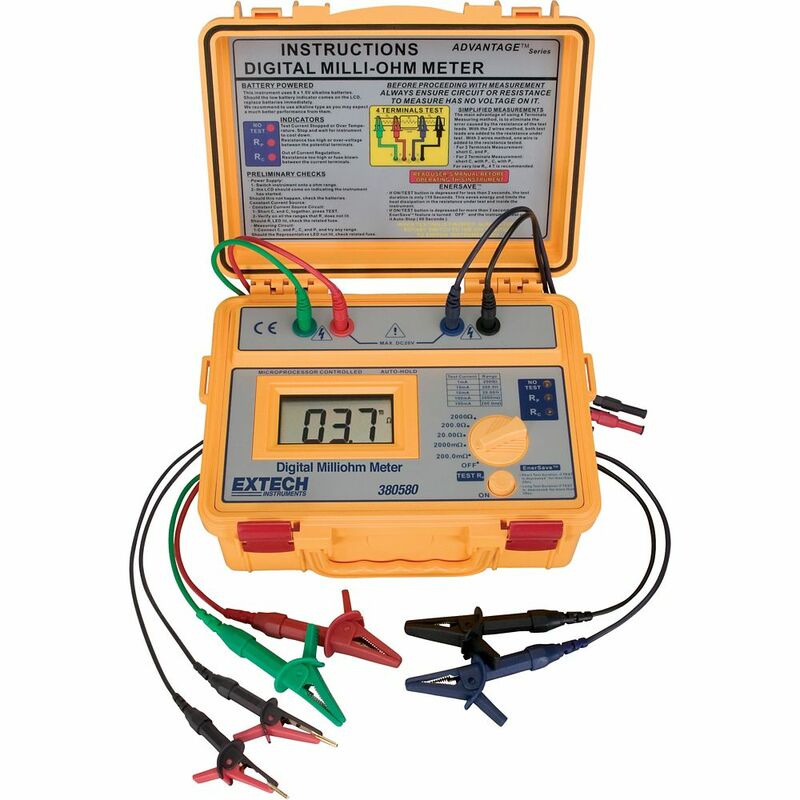 Battery Powered Milliohm Meter The 380580 is a High accuracy, high resolution portable Milliohm Meter (Battery operated) for field use. Four terminal Kelvin measurements. Complete with 8AA batteries, and 2 sets of test leads (4 wire with 4 alligator clips and 4 wire with 2 Kelvin alligator clips).